Super Savings Item! Free Shipping Included! Save 34% on the Carlson Extra Tall Pet Gate, with small pet door by Carlson at Spoil the Baby. MPN: 0941 PW DS. Hurry! Limited time offer. Offer valid only while supplies last. Carlson Pet Products Extra Tall Metal Gate At 36 inches tall, the added height makes this gate just right for large pets and pets that like to jump. Carlson Pet Products Extra Tall Metal Gate At 36 inches tall, the added height makes this gate just right for large pets and pets that like to jump. Expands from 29 to 34 inches wide. Add the included 6-inch extension and expand your gate to 38 inches wide. Convenient walk-through design has an easy, one-touch release handle. Patented pet door is 10 inches by 7 inches to let small pets pass through, while everyone else stays put. Pressure mount system makes set-up quick and easy.• Pressure mount system makes set-up quick and easy. 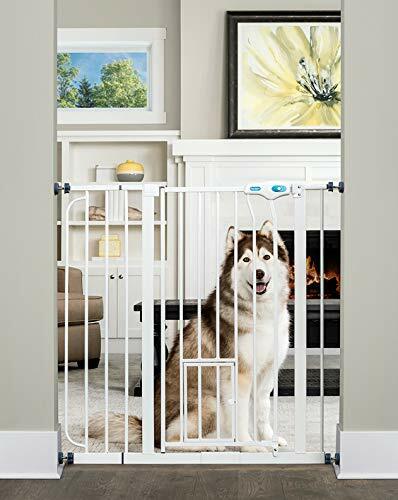 • All-steel construction is sturdy, durable, lead-free, non-toxic and chew-proof Specifications: • 36” H x 29-34” W• Includes a 6-inch extension to create a 38-inch expansion• Pet door is 10” H x 7” W• White Amazon.com An essential tool for homes with pets, the Carlson Extra-Tall Walk-Through Pet Gate is a convenient, chew-proof way to contain and protect both your pet and home. Made of steel, the 36-inch-tall gate is designed with a pressure-mount system for easy installation and is ideal for extra-wide openings. The #0941PW expands from 29”- 38” and that includes only one 6” extension.. The walk-through design features a one-touch release handle so you can easily pass even while carrying things. A 10-by-7-inch pet door lets small animals pass through while everyone else stays put.